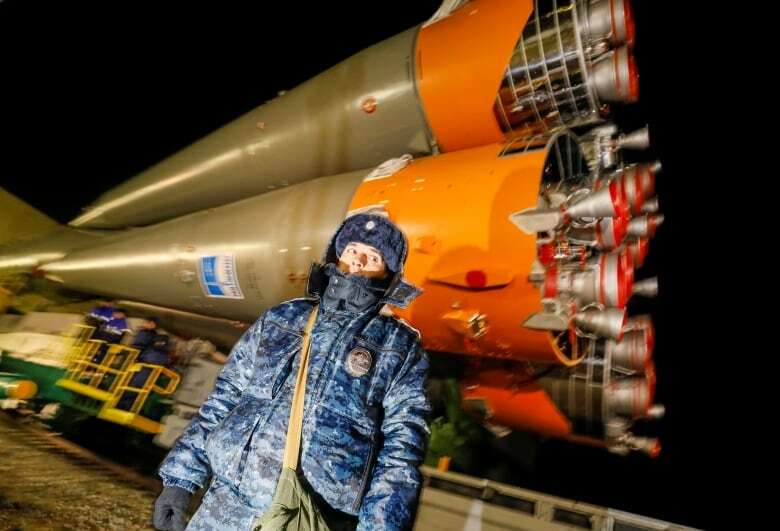 A Russian Soyuz rocket has been transported to its launch pad in Kazakhstan, ahead of Monday's liftoff for three crew members, including Canadian David Saint-Jacques. 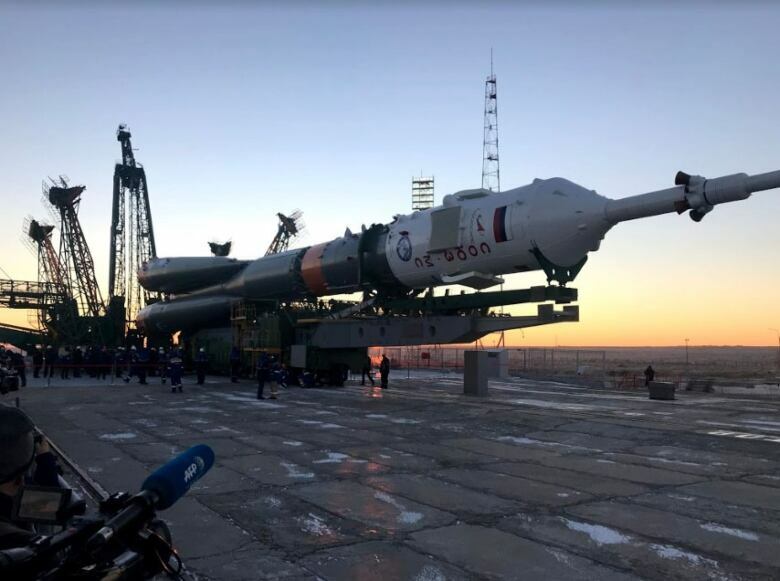 Under cold, clear skies in central Kazakhstan, the Russian Soyuz rocket that will take Canadian David Saint-Jacques into orbit was carefully manoeuvred out of its hanger and brought by train to its final position before Monday's blast off. The so-called "rollout" is one of the most important rituals in the pre-launch routine for the mission that will take Saint-Jacques and two other astronauts to the International Space Station. 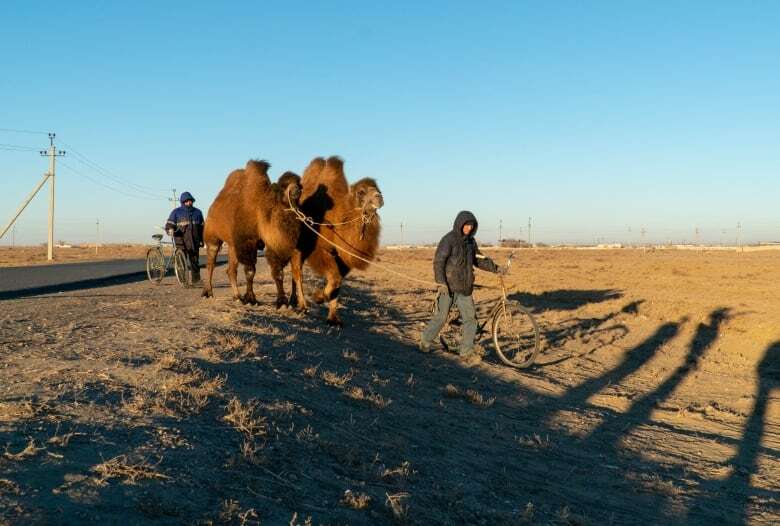 The event, which is steeped in tradition, drew hundreds of spectators on a bitterly cold morning to Russia's Baikonur Cosmodrome, set in the flat, desolate landscape of Central Asia. The pre-dawn procession began with the spacecraft being eased from the hangar where it was assembled, with its four giant engines coming out first. When the slow-moving train arrived at the launch station almost two hours later, the rocket was eased into a vertical position with the help of a giant hydraulic arm. "It was wonderful," said Canadian Josh Kutryk, who was selected as one of Canada's two new astronaut candidates in 2017. He's part of a large delegation sent by the Canadian Space Agency to witness the launch. "To be fortunate enough to see the rocket roll out and go down the railway tracks, and to see it get fuelled and finally passengers put aboard, it's fascinating to think we are doing this." By tradition, the cosmonauts and astronauts do not take part in the rollout. Earlier this week, Saint-Jacques and his two colleagues, American Anne McClain and Russian Oleg Kononenko visited the rocket and tested the capsule's equipment for the last time. 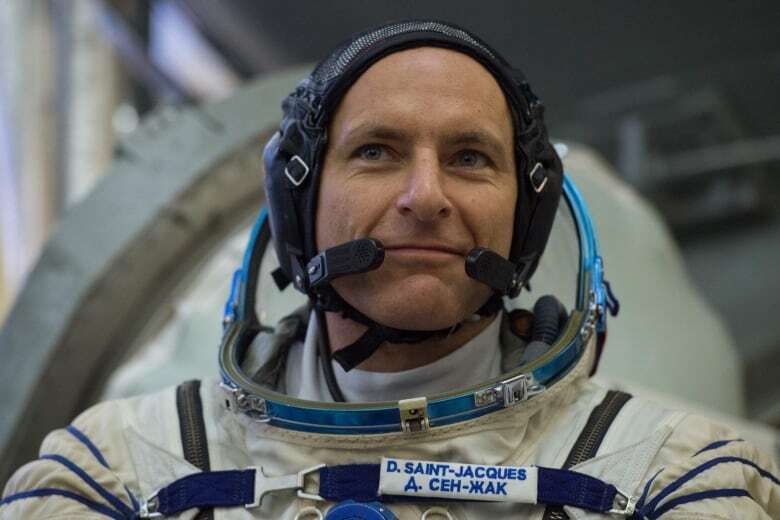 Saint-Jacques is expected to hold a final news conference in Baikonur Sunday, but in previous interviews he has expressed confidence in the technology and said he's eager to get his journey started. A Russian Orthodox priest will officially bless the rocket Sunday and the crew will get a separate blessing just hours before liftoff, which is set for 6:31 ET Monday. 'I feel proud and happy for David," said Kutryk. Watch our LIVE interactive special featuring Canadian astronaut Chris Hadfield starting Monday at 6 a.m. ET on CBCNews.ca and CBC News Network. Saint-Jacques's wife, Vé​ronique, and two of their three young children were in the crowd and cheered as the Soyuz was lifted into its final liftoff position. 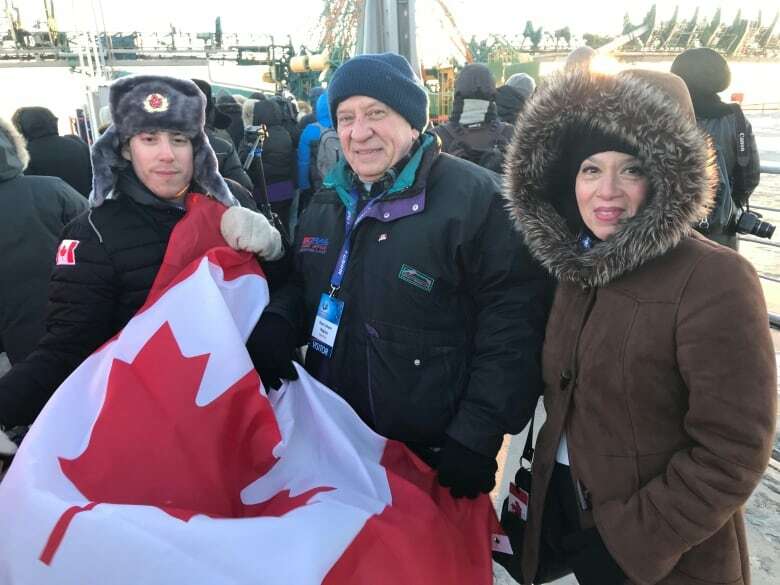 Among those waving Canadian flags were Michael, Joe and Patricia Olson from Williams Lake, B.C. Michael Olson says they were so inspired by meeting with Saint-Jacques two years ago they decided to fly all the way to Central Asia to send him off. "I've always had an interest in space travel," he said. "[When] we met David we told him we were going to see his launch, so we are fulfilling a promise." His mother, Patricia, says she never expected she'd end up in the middle of Central Asia watching a rocket blast into space. "It's unbelievable," she said. "He's taking us to places we never thought we would." Several tour agencies offer visits to Soyuz launches, with prices usually in the range of $5,000 Cdn per person. Ever since the retirement of the last space shuttle, Russia's Soyuz program has been the only way to bring astronauts up to the ISS. NASA pays roughly $80 million US a seat per astronaut and divides them up between nations that financially support the ISS project. Canada's contribution led to Chris Hadfield's memorable mission as the ISS commander ​five years ago, but Saint-Jacques's trip is the only one currently scheduled for a Canadian astronaut. The only other active astronaut with the Canadian Space Agency, Jeremy Hansen, may have to wait several more years before he gets slotted in. The Baikonur facility was built in the early 1960s during the heyday of the Soviet Union's space program. 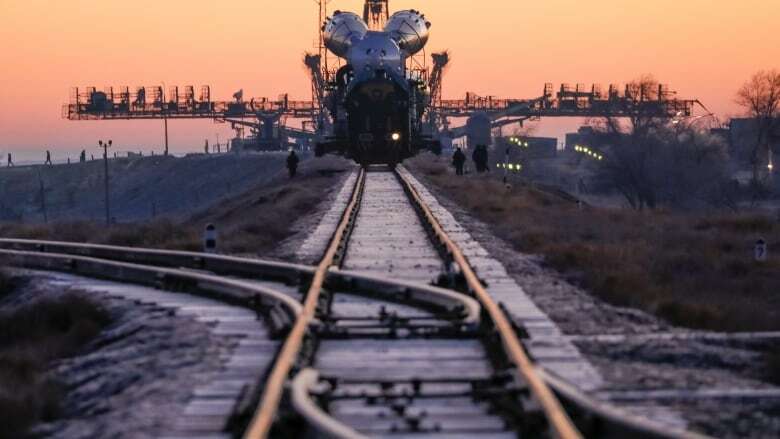 Although Russia has since built a new cosmodrome in the country's far east, the Vostochny facility only handles cargo launches, and launches in Kazakhstan are expected to continue for the foreseeable future. Saint-Jacques's launch was initially scheduled for later in December but it was moved up after the last manned Soyuz launch in October failed to reach orbit. The two crew members escaped unhurt after a risky high atmosphere ballistic descent back to Earth.